Coaching young people and adults is a challenging and enormously rewarding role. Players need expertise, support and passion at every level of their development; this course is designed with players’ needs at its core. In turn, the experiences, tasks, practices and sharing of ideas which you experience during the course are designed to help equip you with the tools you need to meet your players’ needs. Just as players learn quickly, so do coaches. The challenge for all coaches is to learn as they develop, just as players do. 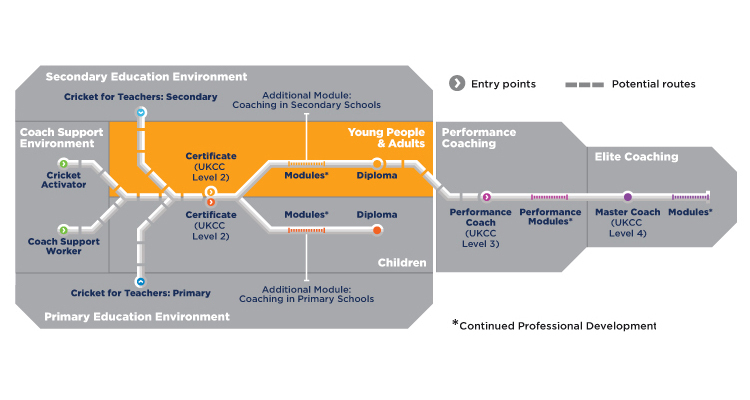 The course is designed for coaches who are going to predominantly coach young people and adults (13 years+). They may be new coaches, existing UKCC1/ECB L1 or childrens coaches who wish to access ‘young person and adult specific’ content. Coaches will be required to attend an induction evening and eight three hour modules (usually across four days) and complete six sessions of supported practice usually in your own club coaching environment. Current Safeguarding Young Cricketers certificate or equivalent. Over the duration of the course you can expect to explore the following questions. What is the role of a young people and adults coach and what does good coaching of young people and adults look like? What sorts of skills can young people and adults learn in cricket coaching sessions? How can I develop my own coaching philosophy and why is it important? What tools do I need to learn from experiences? How do young people and adults learn? What are the players needs and how can I help to meet them? What are the different types of practice and what skills do they develop? What tools can I use to help players learn in my coaching session? How can I adapt my coaching session depending on the practice type and what skills players are learning?